If you want to hide a specific Hard Disk Drive from others on your computer, you can do it simply without using any third party tools. This trick works in Windows 8, 7, Vista and XP computers and all you have to do is to visit the Disk Management page. 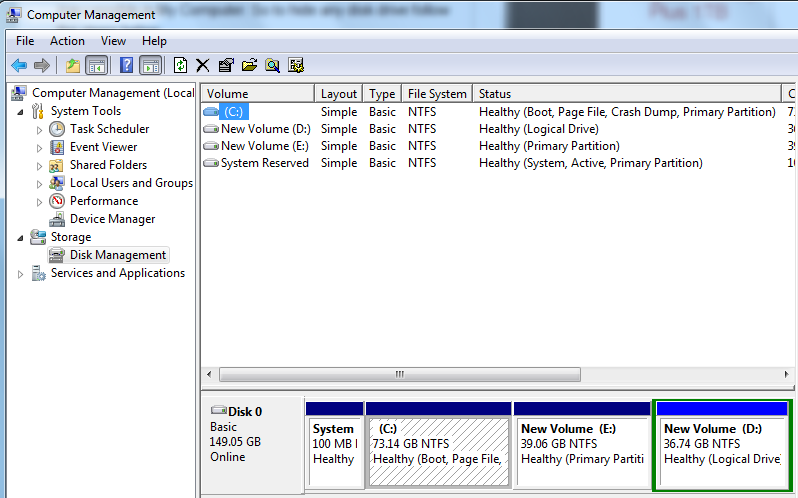 Here you will see an option to select the partition you want to hide. Select the letter assigned to the partition you want to hide and simply delete it. Now onwards Windows will not be able to access that drive and it will be hidden from everyone until you recreate it. For step by step instructions, keep reading. Now computer management Window will be opened. Now you should select the drive letter which you need to hide from the My Computer list. You should delete the drive from Disk Management to disable it and make it completely inaccessible for Windows. You must understand by deleting a partition, you are going to lose the data too. If you don't want to lose the data present in the HDD unit, it is better to take a backup before performing this process. Whenever you want to access the hidden drive on your PC, you can reverse the steps. After creating the deleted partition here, Windows starts to recognize and access the partition which was hidden from it. You do not need to install any unknown applications to do it. This trick is supported in Windows 8, 7, Vista and XP.